Much has already been written about the remarkable young Japanese pianist, Nobuyuki Tsujii who was born blind. He made his concert debut at age 12 and went on to win the 2009 Van Cliburn international piano competition. His career took off from there. On this concert recording he tackles that “rite of passage” - as Katrin Haase indicates in her notes to the Blu-ray disc - Tchaikovsky’s First Piano Concerto. 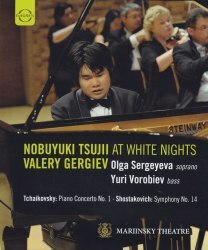 According to the title of this disc, the concert took place at the “White Nights” Festival in St. Petersburg during June and July when the sun never seems to set. The venue is the rather gaudy Mariinsky Theatre which appears to be brightly lit. Conductor Gergiev guides Tsujii to the piano and the concert begins with little ado by the majestic horns and crashing piano chords of the Tchaikovsky concerto. Tsujii looks young for his age and has fairly slender hands and long fingers. His performance is one of both power and delicacy, not as volatile as some, say Martha Argerich (but no one comes close to her in that department). Coordination with Gergiev under normal circumstances would seem difficult, but Tsujii is truly amazing here given the fact he cannot see! Gergiev conducts without a baton in this work with his trademark fluttery fingers and frequently looks over his shoulder at Tsujii. For the large part they are very much together and only on the rare occasion is an attack a bit ragged. The cameras focus on the keyboard, as they should, and when they turn to the orchestra more times than not it is to the woodwinds that our brought to the viewers’ attention. One would like to see other sections of the orchestra more often and occasionally a shot of the whole orchestra. Nonetheless, watching Tsujii and Gergiev excel in this concerto is reward enough. After the concerto, Tsujii plays the Rachmaninov Prelude in G sharp minor as his first encore. He has a wonderful touch and brings out the lyricism of the music sensitively. He then announces to the audience in English (with “Good Evening” and words of thanks in Russian) that his next encore will be his own composition, an Elegy for the Victims of the Earthquake and Tsunami. The piece itself is tuneful, if rather old-fashioned, and goes on a bit too long, even though it is heartfelt. The audience is very appreciative and won’t let Tsujii go until he performs a third encore. His last encore is the “November” or “troika” movement from Tchaikovsky’s piano cycle The Seasons. He captures the simplicity of the piece perfectly, and the first half of the concert ends. It might seem a bit strange to conclude a concert celebrating White Nights with one of Shostakovich's bleakest works, his Fourteenth Symphony for soprano, bass, strings and percussion. This, a song cycle of eleven poems on death by the non-Russian poets Lorca, Apollinaire, and Rilke, and the Russian Küchelbecker, is sung in Russian. The subject matter may be dark, but these settings contain some of the most eloquent music Shostakovich composed near the end of his life as his health was deteriorating. He dedicated the work to his good friend, Benjamin Britten. The songs are sung here by two members of the Mariinsky Theatre, who have taken solo roles in recent years. The soprano, Olga Sergeyeva is a tall blonde who is commanding both physically and vocally, although her diction is not ideally clear. She has a tremendous range and superb control of dynamics. The bass, Yuri Vorobiev, has a slightly rotund figure and a rich voice to match. He also characterizes his selections well and can be better understood than she throughout. However, this is one case where subtitles would be helpful, and the booklet accompanying the disc contains no texts. Gergiev conducts with what looks like a toothpick, but orchestra and soloists seem to follow him with positive results. I am glad to have encountered this wholly idiomatic interpretation, even though it does not in any way replace my CD with Galina Vishnevskaya and Mark Reshetin as soloists, and Mstislav Rostropovich conducting members of the Moscow Philharmonic for an experience of real intensity. That is a studio recording and recorded more closely, resulting in greater clarity of the texts. One can compensate with this Blu-ray by watching the singers mouth the words, though Sergeyeva barely opens her mouth at times. The recorded sound is exemplary with excellent balance between soloists and orchestra and the video is crystal clear. There are no extras with the disc except a rather long trailer of Martha Argerich at the Verbier Festival that is indeed enticing. The booklet notes, while generally satisfactory in describing the works and a brief background of Nobuyuki Tsujii, do not even mention the two vocalists. The writer, Katrin Haase, however, makes a hash of discussing Rachmaninov’s preludes. The prelude in this concert is from the Opus 32 of 1910 where Haase claims it was published in 1903. The preludes of Op. 23, rather than 32, were published in 1903. Earlier she states that a year after Rachmaninov completed his composition class in 1891 he “wrote his famous Prelude No. 12 in G sharp minor, Op. 32, which would bring the composer fame throughout his life.” The prelude the writer is referring to is not the one Tsujii is performing here, but the Prelude in C sharp minor, Op. 3, No. 2 that every budding pianist knows and that the composer grew tired of playing because he was constantly being requested to perform it.